Very responsive. Couldnt ask for more. Communication and procedures very clear, too. Left a message regarding AC; no problems. Has to ask to have frying pans replaced. Ones we found were damaged and not usable. Response was truly excellent. Much appreciated. (Suggest someone inventory other older pots for similar damage. Worked OK for our groups short stay. Comments above more owner issues, that will require little more investment for long term rental consideration, it seems. Trying to not be too picky, but putting myself in shoes of both owners and property managers and what could seem helpful. We enjoyed our week very much. It was a wonderful location, very quiet and so close to the beach. Nice house and the location is so close to beach. I called to inquire about places in Manzanita and the staff member I spoke with was very helpful with recommendations, quickly sending several options for our stay. 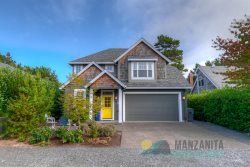 We had a great time at this Manzanita Beach house. It was large enough to accommodate 4 adults and 3 children as well as our dog! The home was well equipped for cooking, very clean, and close enough to pop out to the beach when the rain cleared. Getting the email with instructions a few days before our trip was great. Loved the keyless entry with the little cards for everyone to fill out and keep with them. We were also glad that we only had to strip the beds, start one load and dishwasher. Glad to pay that cleaning fee so that's all we had to do. We've stayed at places that wanted you to basically clean it upon departure, and frankly those places weren't as spotless as The Beach House was. Really loved this house, plenty of room for 8 adults. Well stocked kitchen and so close to the beach and the bay. So prompt when we locked ourselves out after hours. Great visit with family and we had excellent weather to walk to beach and national forest. Loved the ambiance of the downtown area. Not too commercialized but has everything you need as far as food and dining out. We were all very comfortable in this cute house. Minimal interaction but everything was great. My only less than glowing comment would be that the check out pre-cleaning seemed a bit onerous given the cost of the cleaning fee and the rental overall. The place is really lovely, so clean and well stocked and in such a great location. We would definitely stay again.